Within the art world, the basic elements of art include space, line, shape, form, texture, value, and color. However, after Renata Cathey interviewed Frank Frazier at the Cottonwood Arts Festival on May 3, 2009, it appears that for Frank Frazier, all the basic elements of art lead back to one � color. Now the definition of color that Frank Frazier so masterfully concentrates upon and portrays in some of his artwork is a type of color that is often forgotten. Black and White are the colors. And although Barack Obama, the current president of the United States, dedicated a speech to discuss the relationship between Blacks and Whites and other colors (yellow, red, etc.) during his campaign, many people have forgotten the problems, triumphs, stereotypes, and history that surround colors, especially the colors black and white. Now you may ask, �How does the black and white colors associated with race and civil rights in the United States become associated with art?� The answers for Frank Frazier as you will see later in the interview dictated below, are associated with some of the subject matter of his artwork. For instance, the Little Rock 9, a group of 9 kids who were responsible for integrating a school in 1957 against great resistance by both the governor of Arkansas and its white citizens who enforced the illegal Jim Crow laws is addressed by one of Frank Frazier�s pieces. He created the piece with shoe polish from the 1930�s for two reasons. The first reason, the black shoe polish was used to paint white folks face in the 1930�s to symbolize black folks during that time. The second reason was to redefine the usage of the black shoe polish to symbolize something more positive like the Little Rock 9. Frank Frazier also did a piece that portrays the conflicts surrounding the Black Panthers in Oakland, California during the sixties. Interesting enough, the colors of the Oakland Raider�s football team is black and white. Frank Frazier Well, you ain�t that old, where you get all that grey hair from? You faking it, huh? Frank With Frank Frazier and my wonderful wife Judy and my grandson. We like to keep family all together. Renata That�s great. How long have you been doing your art? Frank I have been painting. I am 66 years old. I have been painting for 50 years. When I came out of my mother�s womb, a paintbrush dropped on the side. Renata And from there, you picked it up and you been painting every since. Frank And look right there. Great-Great grandbaby. Great grandbaby, yea! Renata Hi darling. Now I see in your artwork, there are several mediums. You have cloth and what else do you use? Frank I use ink and different things but the important work is the work over there, the black and white pieces. Renata Why are they black and white? Frank Number one, they are black and white, because when you go back to the sixties, there was a lot of black and white but that�s all about the civil rights. The piece up top is the little rock 9. Frank And the other pieces are about Selma and the other one underneath has to do with Oakland California because a lot of folks didn�t realize that in Oakland was the movement for the Black Panthers. Frank Yes. With Huey P. Newton. Renata How many pieces in this series? Renata Why did you choose shoe polish? Frank That�s them protesting or that could be them moving into the schools and all. You read the signs and on one side is the white folks making their statement and on the other side is the black folks making their statements. Renata And what medium did you do that one in? Frank Thats ink. And here comes my daughter. Renata Did you draw that all free hand? Frank Because I just don�t believe there�s real art there. Frank Naw, that�s - down on the bottom that is cotton and that cotton came out of some of the plantations in (from) Louisiana and there, I am symbolizing that we have made a direction (change) and we have made a movement and we are going farther. And you know I am a big Obama supporter. Watch this. Jalisa! Look at her shirt. She is the future. Renata How old is she? Renata How do you spell her name? Frank Let her do that, she can talk well. Jalisa, come here! Renata Hi there. Spell your name for me. Frank And tell her who is on your shirt. Frank And who is he. Frank And what color is he? Frank She�s kind of conservative I guess. Renata So is there anything else you like to add? Frank I am glad to see you out here doing what you doing. Frank Because we need � See there are so many negative things that they show us black people doing. Like all our children don�t want to be drug dealers and all of that and sometimes they (the children) need to see us, like me and you. There are other positive things that we can grow up to be like a reporter like you or an artist like me or a school teacher or a dentist or doctor. You know we don�t have to be necessarily a basketball player or movie star. There are other things we can do creative and all. And I am real serious about that! Renata I see. You are very serious. Frank I am very serious about that! Renata How long have you and Mrs. Judy been married? Renata So she has been there from the start. Frank Yes. Even when she makes me mad. Renata But it don�t mean we don�t still love you. Frank All right. The only thing she does wrong is kick my shoes out of the way in the morning. Renata So your artwork and price range, what does it range from? Frank Anywhere from $700 to $10,000. But I try to work with people. Renata Are you on the internet? Frank I am on other people�s internet. I don�t want to be that commercial. I want to be like the Bentley of Art. I don�t want to be easy to get. It�s not just about being so expensive but just not easy to get. I don�t have a lot of prints. I don�t have anything with graphic art and all of that so I don�t do a lot of prints because I want to be a little difficult to get. I think I�m good. Renata So all (mostly) originals? Renata Anything you like to add? Frank Its good to see y�all young folks doing things together and he got his pants pulled up. You know what I am talking about. This was not the end of the interview with Frank Frazier but more like a long introduction to not only Frank but his family as well. In fact, we (my wife and I) talked to him more at his home and studio three days later during a private art show. There were several other artists and we discovered that his �children� extended to more than his wife, children, grand children, great grand children, and Great-Great grand children. As he mentioned in the interview above, Frank Frazier is serious about showing that black people can do more than play basketball or be a movie star. The visit to his home exemplified his seriousness by having a suite of talented artists, sculptors, poets, writers, and gallery owners at his house when we arrived. We interviewed many of these artists so stay tuned for more �forgotten� stories, images, art, and audio. Certain areas of his house had painted signs that clearly designated your color � black or white. 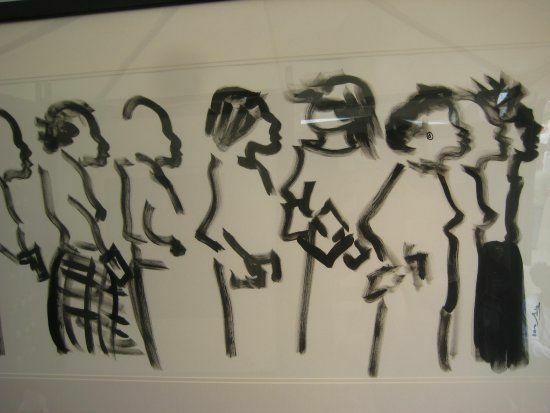 There were drawings on the wall in black and white paint as well as drawings on paper in ink and pencil. There was a �black waiting room� and a �white waiting room� and the usage of artistic color throughout his home and studio quickly reminded me of what we often forget � that colors, especially black and white should be respected and remembered especially in art.